Sorry to break it to you, folks, but you can’t “create” viral anything. Virality doesn’t just happen. It’s not luck of the draw. And it’s bloody hard work. And if you’ll stick with me here, I’ll explain why. So, there’s been a story kicking around for the past few years now, about a car company in small town America. And not just any old car company. This is a car company who really understands how to build relationships, and by extension, community. Here’s how they do it. This company monitors Twitter, and whenever they see anyone from their neck of the woods tweeting about a car accident, they reach out. Immediately. And they offer them the use of a car. With this one small yet significant strategy, they’re absolutely nailing online relationship building. They listen, they react, they care. They’re offering a helping hand, not a hard sell, and their community loves them for it. I bet you if that company released a funny video, or published their latest blog content, it would go viral. Why? Because they have built a strong, loyal community based on trust, and that community would be happy to share that content with all of their social communities, and so on. But here’s where it really get’s interesting: Will that video or blog content end up on CNN, or The Tonight Show with Jimmy Fallon? No. Will it garner millions of views or clicks? Probably not. Will it generate a number of qualified leads and end up in a few cars sold. You betcha! And that’s what real viral content does. It leads to conversions. It’s not actually TRAFFIC you should be seeking – it’s prospects and leads and sales. Daniel Newman wrote recently about the futility of this “virality Golden Goose”. As he says, you might be thrilled with high vanity metrics, but really, what do those numbers really mean to your bottom line? Usually, very little. The inspiration for Daniel’s post mentioned above was the latest incarnation of CMOTalk, which he hosts with V3’s Shelly Kramer. Titled, Viral Content and Community Building, the two of them discussed this mad rush to create so called viral content. You can create all the content you want — “viral” or otherwise” — but, much like the tree falling in the forest analogy, if you haven’t been strategic about building online relationships across multiple channels online, it will never be found, and never be consumed. As Shelly and Daniel laid out in their podcast, you get what you give when it comes to community building. Strong communities don’t happen by accident, you have to be strategic. You have to do your research, and engage in online monitoring and social listening, much like our car dealer friends above did. What does my company/client do? What words or phrases do people in this industry use and care about? What are they currently talking about? Where are they hanging out online? What kind of content are they sharing? Can you tease out any trends? Who are the influencers you should begin reaching out to? What are they sharing with their communities? I’ll leave you with a few more things to think about the next time someone asks you to “create viral content”. Accept that you aren’t a magician. Make friends with Google Analytics to track what types of content have been super successful in the past. Stay abreast of what’ happening in the world around you, both on the pop culture front and the news. And engage and use your community. Stay realistic in your approach. Understand your audience. And figure out what you can do that might surprise and delight them. While you might not end up with 500,000 shares, you might end up with five new customers. And let’s face it. That’s where the real money is. I strongly recommend you head on over to CMOTalk and have a listen to the entire podcast. I have barely scratched the surface here. And be sure and sign up, so you don’t miss an episode! 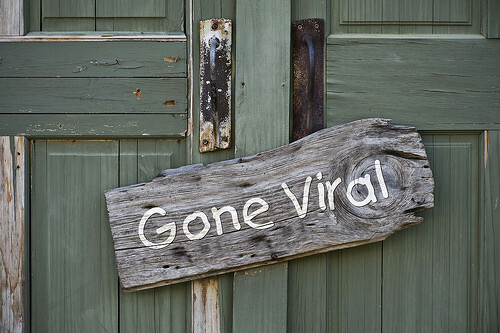 Are you a person who “wants something to go viral?” Do you agree that community is an integral part of the equation? I would love to hear your thoughts!